Grayson, Bruton, 16, says he got hooked on mushing in 2008 when he took a few lessons and trips. He now has 18 dogs and in the summer, he and his dogs work in Seward for Glacier Tours. Grayson is in the 11th grade at Su-Valley High School . His hobbies include firefighting and being a dog sledding guide. 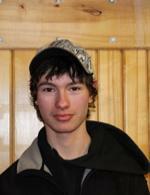 After he graduates, he wants to go to UAF and get a degree in Fire Science and says, “yes” he will continue mushing.